The modules contains an FT811Q graphic controller and a 5" TFT color display with 800×480-pixel resolution, Each pixel can display 262K different colors. 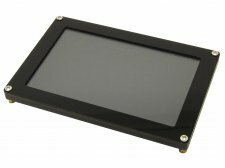 The TFT display is covered with a capacitive touch panel which can be used as an input device. The FT811CB utilises the FTDI FT811 Embedded Video Engine, EVE. Graphic, audio and touch features of the FT811 chip can be accessed with the FT811CB. For a full list of the FT811’s features please see the FT811 datasheet.